The interesting thing about technology-reliant mediums is that the more they advance, the louder their purist fanbases will shout about the decline of them. We have animation junkies that rue the day CGI became widely-used. We have movie buffs who believe that with the invention of color film and microphones, filmmakers have gotten lazy and uninventive. With music we have elitists who think that classical is the only way to go, or Punk fanatics that swear by striped-down, “unpretentious” styles. Videogames, on the other hand, are an interesting case: the interactive medium’s made strides quicker than any other perhaps, and with each new technological era clearly telegraphed by console cycles, allows for easy chronicling and quick-building nostalgia. This, and a majority of people making up games media/critics being brought up on old-school platformers, means that classic games and traditions therein were never really left behind. Look at the onslaught of old-school inspired games being made today: from the 16-bit-focued indie sphere to the perpetual re-release of Super Mario Bros. on every Nintendo console ever, pixel art and chiptunes have never more hip and with it. The other interesting thing about the treatment of retro-looking games, then, is the backlash, or at the very least, bemoaning. The Artist was showered with awards when it come out in 2011. Everyone lost their minds when they learned that Disney’s The Princess and the Frog was traditionally-animated. Most people think that classical music is cool as heck. So why so many eye-rolls whenever we get a new videogame with old-school graphics or game design? Well for one, there’s that aforementioned glut of the things. Pixel art is cheap, easy to produce, and instantly resonates with a lot of gamers; perfect for an indie studio just getting off the ground, so you can see why it’d be an easy pick. There are also accusations that developers choose the style out of some sort of sick, calculated plot to ride the crest of the trend, praying on poor, nostalgic consumers who don’t know any better than buying everything that looks faintly like the blocky, thirteen-color images once displayed on their CRTs of days long passed. I’m pretty sure the reason is the former, probably because I give people more credit than that, but the point still stands: the market is saturated, and gamers know it. Personally, I’m little tired of it. It’s just so common, and so many of the games get the look and feel wrong. Earlier I said that pixel art and retro game-feel is easy to craft, but it needs to be handled properly regardless, just like any other style, and a game has to really nail it to get points with me. I realise that that may have been a lot prelude for a review about a game where you spend your time playing as a shovel-bearing knight tasked with ridding a Medieval-flavoured land from mounds of dirt and hapless rats with propellers tied to their backs. But the farfetched world of Shovel Knight fits in line with the strangest of retro videogames (like Monster Party. Seriously, how did that happen?). You see, the game looks, feels, and plays like a lost NES game; masterfully so. Shovel Knight is steeped in the influences of the great NES titles, but also has a good deal of modern-day concessions that mix to make an experience that both wholly justify its retro gimmickry, and lets the game stand independent of that. Take note, every other medium: this is how you do a throwback. Of course, the game wasn’t exactly made on the NES hardware: there are a few more colors than the system’s palette allowed for, the music’s extra sound channels are noticeable, sprites are larger and have more frames of animation, and you’ll even notice some parallax scrolling. And of course, the entire package is free from screen flickering and runs at a consistent framrate. The result is a game that evokes the look and feel of an NES masterpiece, while smoothing over many of the limitations those titles ran into. This has paid off, because regardless of what videogames you grew up playing, Shovel Knight is stunning. The game’s retro aesthetic is a testament to just how far pixel art has advanced, despite its simplicity. Each location – from Arctic, Northern light-filled skies to sunset-drenched airships – is creatively realised, and the colors that fill them are expertly composed. The character designs are endlessly amusing (my favourites are Plague Knight and Propeller Knight), and their sprites move with all the charm and fluidity you’d expect them to. The Tower of Fate (the game’s equivalent of Dr. Wiley’s castle, or Gannon’s lair) looms ever-present in the distance of most stages, and invites the same feeling as seeing Dracula’s keep in Castlevania. 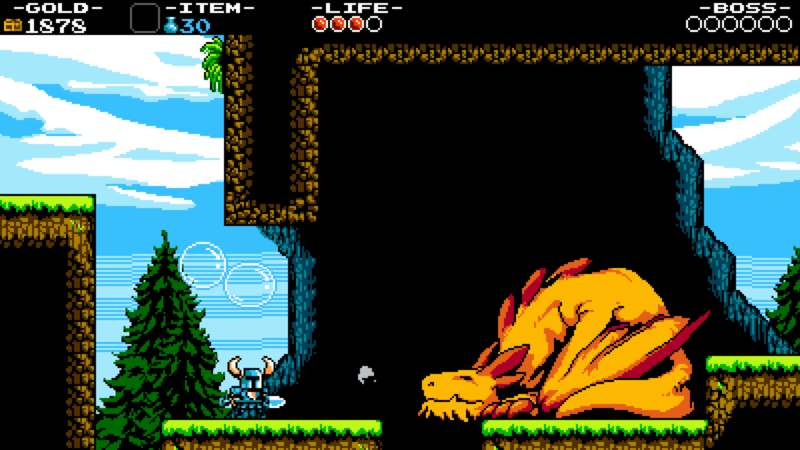 In fact, Shovel Knight has many nods to the games it takes inspiration from (Mega Man, Zelda II, Castlevania, Mario 3), but not once do they feel contrived, or in the face of the player. Nobody says “I am error,” and nobody “sets them up the bomb.” Sure, eight knights stand in your way to the enemy’s stronghold; you use sub-weapons; you can bounce on your shovel like Link or Scrooge McDuck; the stage section screen is an over-head map filled with wandering enemy encounters. But these elements always have twists, and supplement Shovel Knight’s own gameplay. Rather than being a greatest hits compilation, the game plays like an album of old-school-inspired music with the occasional cover song. And since we brought up the word music for the fourth time, let’s talk about that! It’s wonderful; the tracks perfectly encapsulate the feeling of adventure that retro games are so keen on, and like the best chiptune music, are dangerously catchy. What’s really interesting tough, is the soundtrack’s ability to bring the tone down into more serious, subtle territory. You wouldn’t think it, but the game occasionally takes the time to be quietly affecting, giving the player a glimpse into the sombre sides of both the protagonists and antagonists, and the music is a big part of that. Plus, come on, some of it’s composed by the chick who did the music for the original Mega Man (Manami Matsumae)! Do I need to type that again for you? This far in I’ve talked very little of the actual gameplay, but thankfully, it checks out just as well as the other elements. 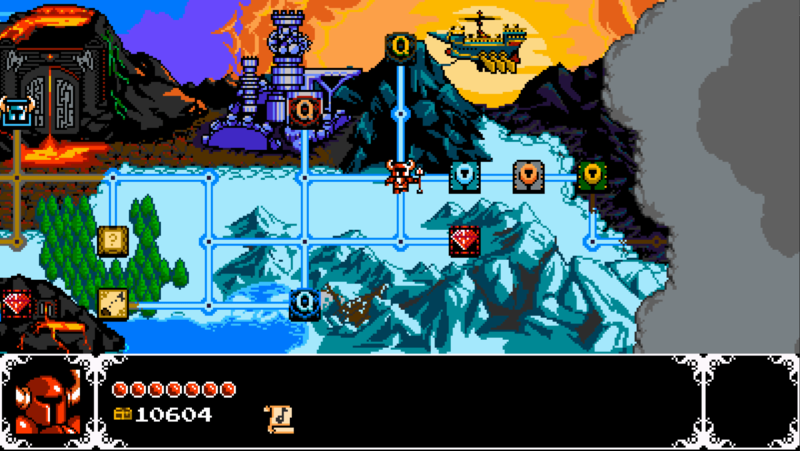 Yacht Club Games, made up of previous Wayforward employees, really knew what they were doing here. The controls are corset-tight, and the platforming is rewarding. Your knight’s shovel is used to slash at enemies, destroy dirt blocks, and bounce atop; an elegant and intuitive system. Each stage has unique elements that are first introduced benignly, but are gradually built upon, ramping the difficulty as the board progresses. Essentially, it follows the old-school, “show don’t tell” mandate. Though this is a game primarily about planning and forethought – instant-death spikes and bottomless pits abound!—, its structure allows for and encourages speedrunning, so I suspect most players will be receptive to multiple playthroughs. The checkpoint system is an example of this open, momentum-based structure, and is a really smart inclusion. Each stage after the first is filled with breakable checkpoint orbs – crack one open, and a resplendent outpour of gems can be yours. Of course, it no longer serves as a checkpoint after this, so a death will send you further back than it would otherwise. The systems lets more-seasoned players increase the tension for a higher reward while letting those who are having trouble use the fairly common checkpoints as crutch. And man, are you going to want that gold, because it’s used to buy health and magic upgrades, new suits of armor, sub-weapons, and some cool shovel skills. You see, better players who feel confident are able to harvest checkpoints and thus purchase upgrades quicker than others, allowing them to make it through the game that much more smoothly. Players who have difficulty progressing on the other hand, will have a lot of deaths to look forward to, and hence, less cash: each death lets loose a good chunk of your gold, which can be recovered if you make it back to that spot, but disappear if you die again. Presumably, this would have said players grinding through previously-completed stages to make up the damage, but would also inspire them to get better, because with no fear of running out of lives, generous checkpoints, and the ability to play easier stages to reclaim gold, the tension is well-balanced. Personally, the game didn’t give me too much trouble (though I fancy myself quite proficient at 8-bit side-scrollers). It has bite, to be sure, but it never felt discouragingly difficult like many of the games in its lineage. The only time I felt particularly challenged was when I broke too many checkpoints for my own good, or the latter end of the new game + mode (which doubles the damage taken, replaces health-filling platters with bombs, and gives each stage only two checkpoints apiece). Still, I imagine Shovel Knight will put up a fight against players who aren’t used to frantic bosses or enemies who’ll gladly knock our hero into deathtraps if they aren’t careful. The bosses – consisting of other oddly-themed knights – are a highlight, I’m glad to say. Each is a fast-paced battle, and its characters are complete with their own charms and personality. That’s another thing you’ll see a lot of in this game: personality. From townspeople to enemies, care has clearly been put into every pixel, and the humor and overall weirdness really shine through to create a quaint little world that really wasn’t necessary in the first place. And with all the collectable music sheets, a new game + mode, and hundreds of cheat codes, you can see that it’s easy to put in more time than you’d think. And there’s more to come: Shovel Knight’s Kickstarter project met a lot of its stretch goals, so we can expect a gender-swap mode and multiple playable characters to come soon, among other things. I’m impressed with Shovel Knight. I truly am. There really is little in the way of issues here. There are times when you’ll accidently be thrown into a pit without your consent, and occasionally a boss pattern will feel inescapable, but the fun never really gives way to frustration. The only real criticism I can conjure up is the fact that the game will almost certainly be less appealing to people who aren’t fond of the era of games this one takes most of its inspiration from. But even then, I’d wager the most fervent of NES faultfinders would be hard-pressed to not get some enjoyment out of this one. P.S. : Shovel Knight is currently available on PC, Wii U, and 3DS. I’ve played it extensively on PC and 3DS, and can say that you can’t really go wrong on any of the platforms. Although, the 3DS’s screen leaves the sprites looking a bit too small, perhaps, and neither the circle pad or the system’s squeaky, ill-designed directional pad do this side-scroller justice, though I image these issues are remedied by the XL.